With one of us still limping with a broken fibula and the other one not shod quite right for extensive hiking, we spent only about an hour in Deukmejian Park, which has been opened bit by bit again after the Station Fire in 2009. 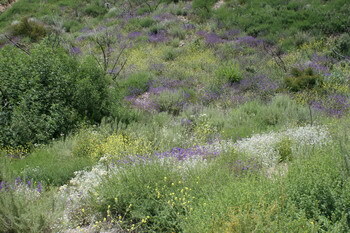 Nature does try to regain what was lost and burned; at least the scrub, grasses and wildflowers are back up this year. To replace the trees lost new ones have been planted. Photos of those will follow in ten years in this blog – right now they are just wee little saplings, protected by mesh and marked by little flags.